I refuse to buy French beans brought in from Kenya or South America but when they are in season in Europe I love to incorporate then into salads or sauté them in garlic oil. They remind me a lot of trips to Paris where the beans are always tiny and tender. This salad feels very French. You could add black olives or capers for a salty bite. Blanch the beans in boiling water for five minutes and then refresh in cold water so that they keep their colour. Shred the lettuce coarsely and place into the bottom of a large salad bowl. 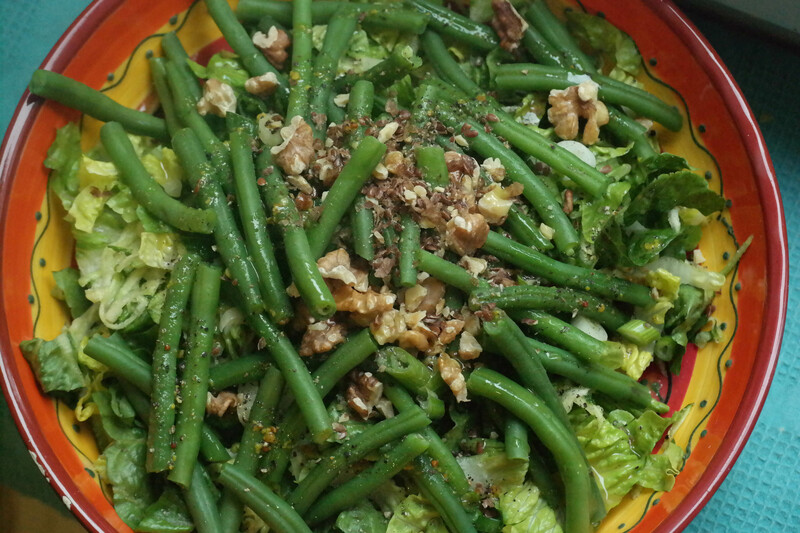 Throw the whole beans on top and scatter the coarsely chopped nuts over the salad. Pour over a tablespoon of balsamic dressing and season to taste. 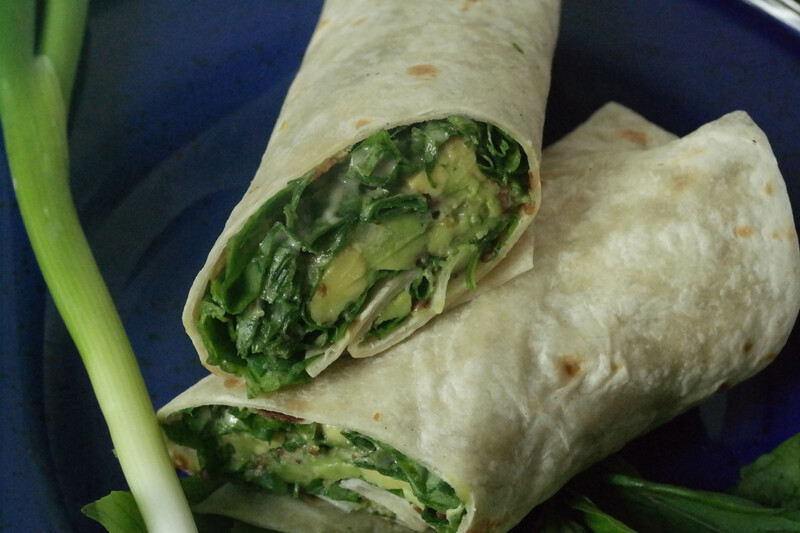 This is a lovely soft and crunchy wrap that is full of nutrition and tastes really delicious. You can use basil or coriander, spinach or rocket, hummus or tahini and add more chilli or leave it out. Spread the tahini over the wrap. Add the spinach and then slices of avocado, coriander, onion and chilli sauce. Season to taste. I love fresh sprouts. They are so crunchy and incredibly healthy. You can buy a greater range these days in supermarkets but growing your own is much cheaper and they taste better. I was delighted to discover a few months ago that they will keep fresh for at least a week if refrigerated in their jar. I have a couple of special sprouting jars that I bought on Amazon that make draining the sprouts easier but, to be honest, you an use a normal jar or a sprouting bag. You can sprout lentils, beans, peas and seeds. 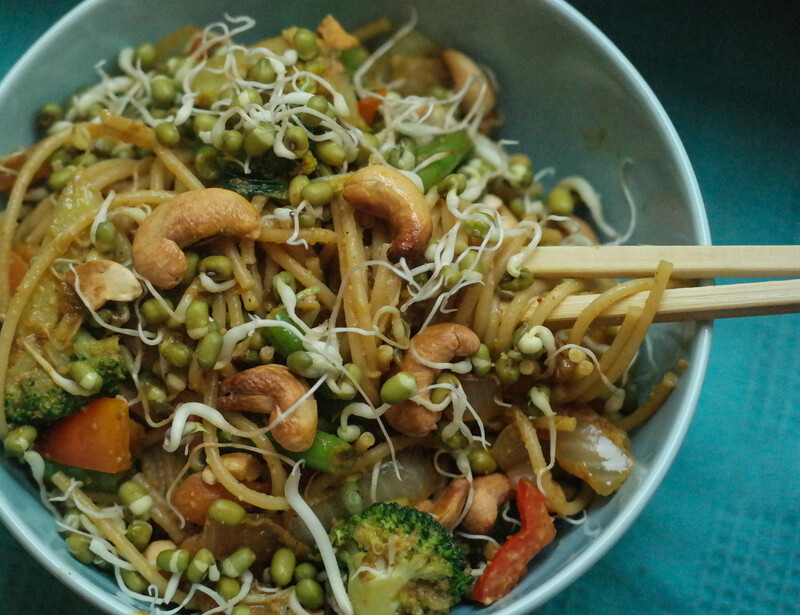 I like mung bean and chickpeas the best. They go really well in salads and stir fries. The smaller lentils and seeds sprout fastest and you will see small sprouts after the first day. 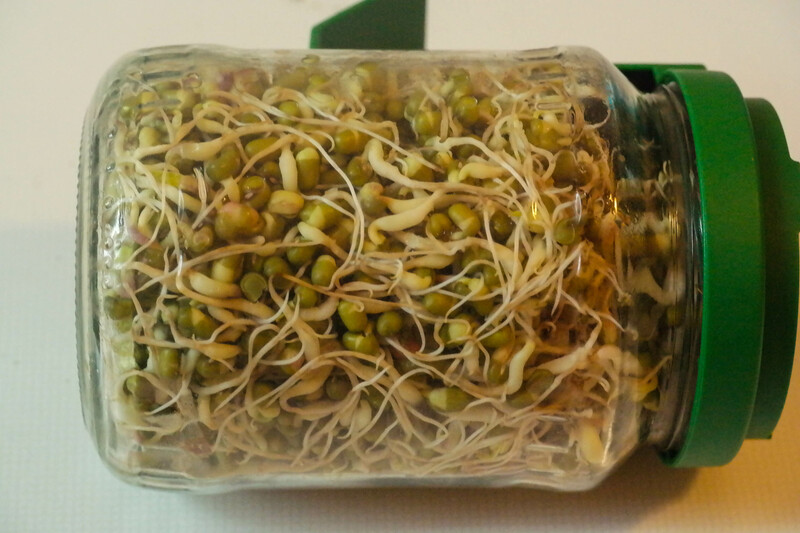 Take a handful of mung beans and place them in the jar. Cover with cold water and soak overnight. The next morning drain the water and rinse in more fresh water. Drain again and leave in a cool place. Rinse and drain daily until the sprouts are the length you want. Then place in the fridge until you want to use them. Tomatoes are so plentiful and cheap at the moment and corn is bang in season. Roasting the corn and tomatoes for this salsa gives a lovely sweet flavour. The cucumber makes it fresh and light. I like it spicy but you can make it to your own taste. Place the corn and tomatoes in roasting tin and cook in medium oven for 15 minutes until the tomatoes are soft. Remove the corn from the cob and roughly chop the tomatoes. Place half of the tomatoes and corn with all the other ingredients in a food processor and blitz till it is a smooth paste. 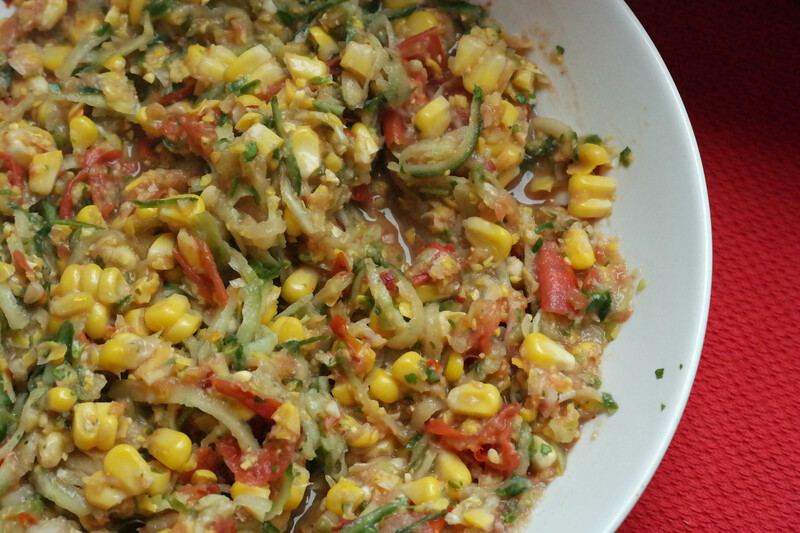 Turn out into a bowl and add the other half of the corn and tomatoes to give a chunky texture. Season to taste. This sauce originates in Spain and is a little like a pesto. The authentic recipe combines almonds and roasted red peppers but I used tomatoes as they are so delicious and plentiful at the moment. Like with pestos, you can use other nuts like pinenuts or walnuts or even seeds. You can use this for just about anything. 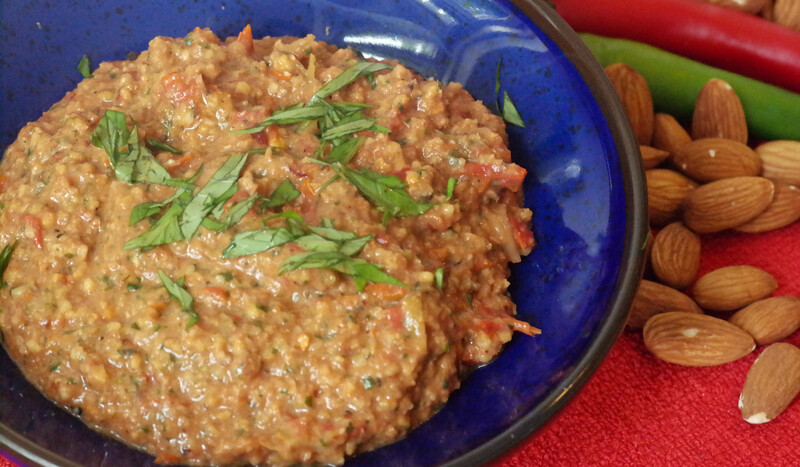 It is great as a pasta sauce, as a chutney inside wraps with tofu, as a dip or a sauce with roast potatoes. Put all of the ingredients into a food processor and blity to a smooth paste. This may take a while to get the right consistency. Season to taste. No Colds or Flu all Winter? Last winter was very long and I succumbed to more colds than I have since I last lived in Europe 8 years ago. I am sure that my immune system was low due to too much stress at work. This year, I want to prepare for Winter a bit like a squirrel and give my immune system the best chance possible to cope with all the germs that are thrown at it working in a school. I have already got back onto my yoga mat and that is helping me sleep better and cope better with the work stresses of a school principal but I to do more. I came across this amazing book last week. 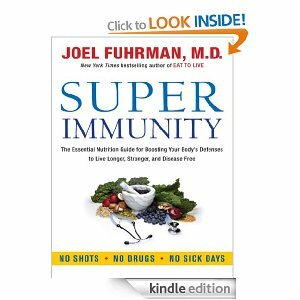 Super Immunity by Joel Fuhrman. I read it cover to cover in one day. It really resonated with me. 1. A diet full of GOMBBS – greens (or more specifically, cruciferous vegetables like broccoli, cabbage and cauliflower), onions (including garlic), mushrooms, beans, berries and seeds. 2. A daily dose of zinc. 3. A daily dose of vitamin D. Part of the reason we get more colds in Winter is due to the lack of sunshine. 4. Exercise that raises the heart rate for at least five minutes, at least three times a week. He also recommends that if you get a cold, you refrain from taking cold medication as this suppresses the natural immune system and will make a cold last longer. You should rest and eat light, plant based meals and the cold will go away in three days. I am trying this out to see if it works for me this Winter. I have cranked up my diet for the last week and the zinc arrives today. Watch this space.